Get the latest FIRMWARE by CLICKING HERE. 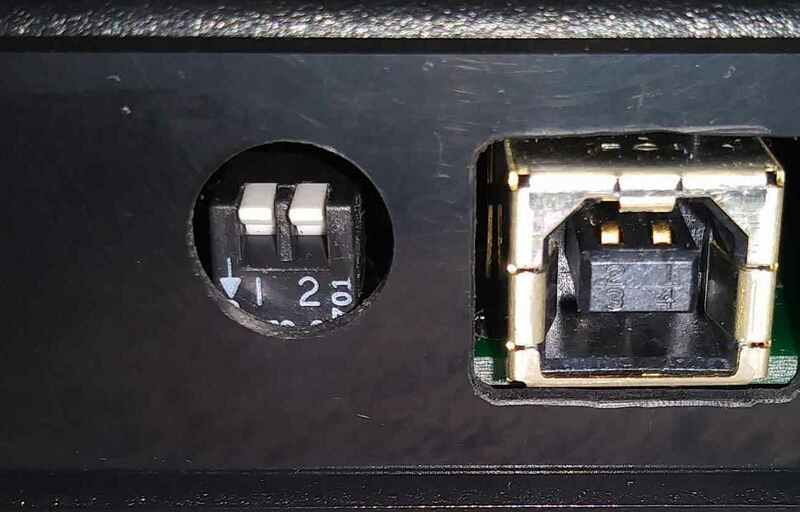 Do you need the USB cable to connect the interface to the PC? 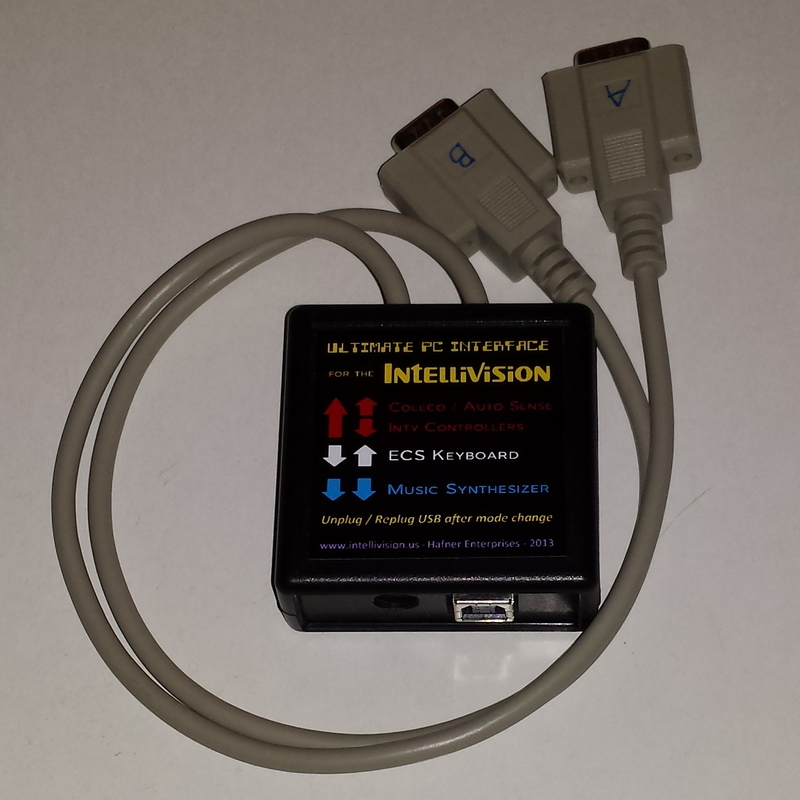 Are you using Intellivision 1 controllers? You will need the Inty 1 dongles. The original purpose of this interface was to support the expansion controllers of the Intellivision and Colecovision consoles. With the release of the VERSION 3 interface, the purpose is to support as many 9 pin controllers and paddles as possible! 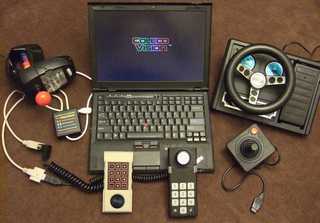 This site focuses on the Intellivision and Colecovision but MANY other controllers are supported also. The only way to play Intellivision and Colecovision games is with their unique and original controllers using the real hardware produced in the 80's. The second option would be in emulation on the PC but the PC keyboard has no way to reproduce the Intellivision 16 direction disc, the Coleco rollerball, or the feel of the controllers. Enter the Ultimate PC Interface. Available ONLY here. 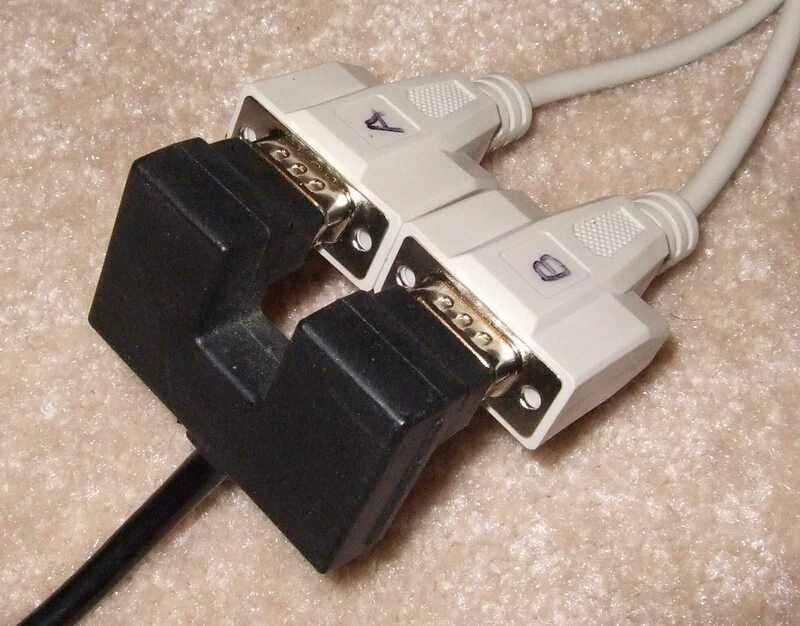 It allows you to connect two (2) controllers and the PC through a USB connector. The controllers can be a combination of any supported controller. What makes this the Ultimate PC Interface? 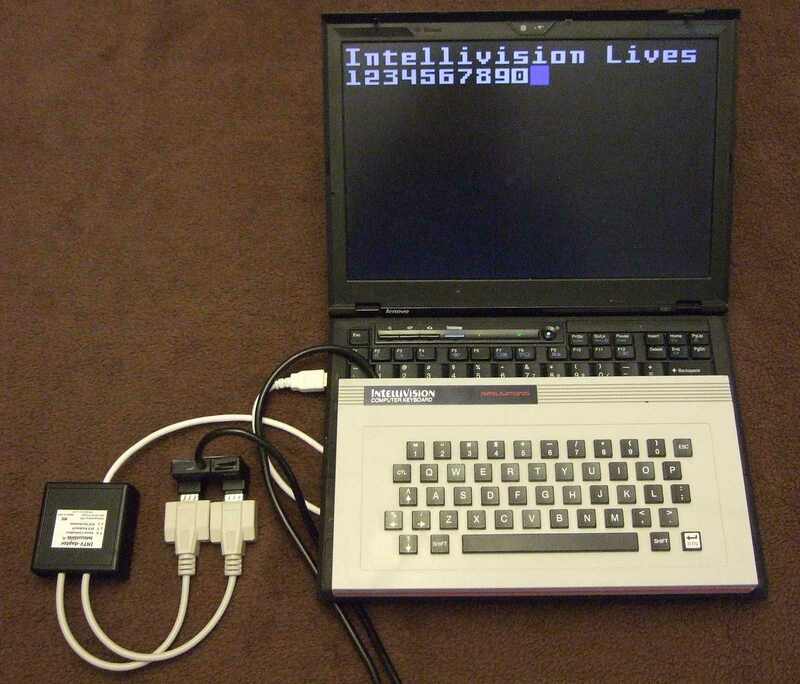 It supports the Intellivision ECS keyboard! Play the ECS games as they were meant to be played. Learn to type 80's style with Flintstones Keyboard Fun. There is no other way to type a Basic program other than with the ECS keyboard! 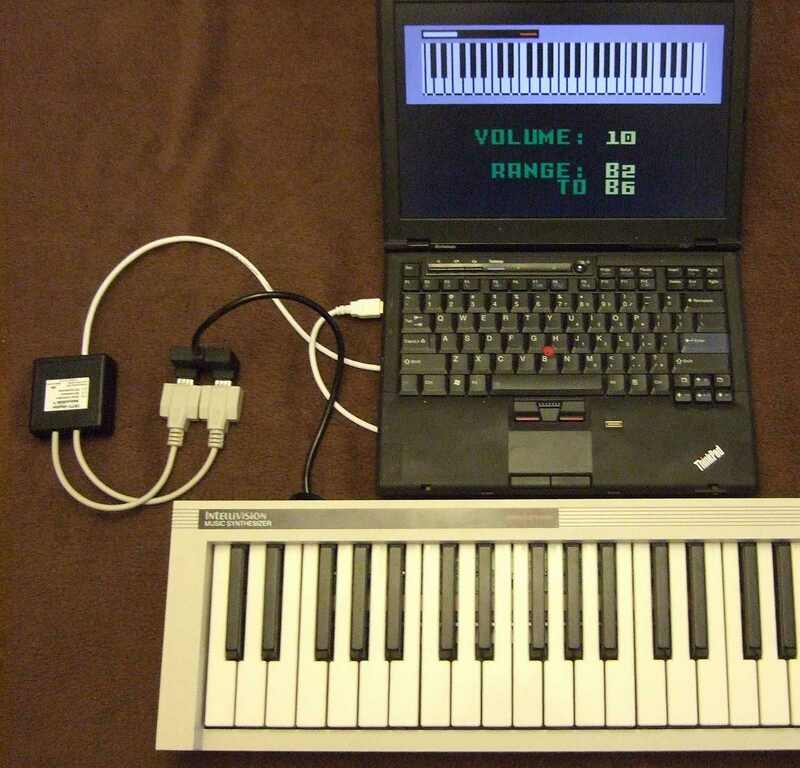 The Music Synthesizer is also supported! Melody Blaster must be enjoyed with the Music Sythesizer.... and now on your PC. 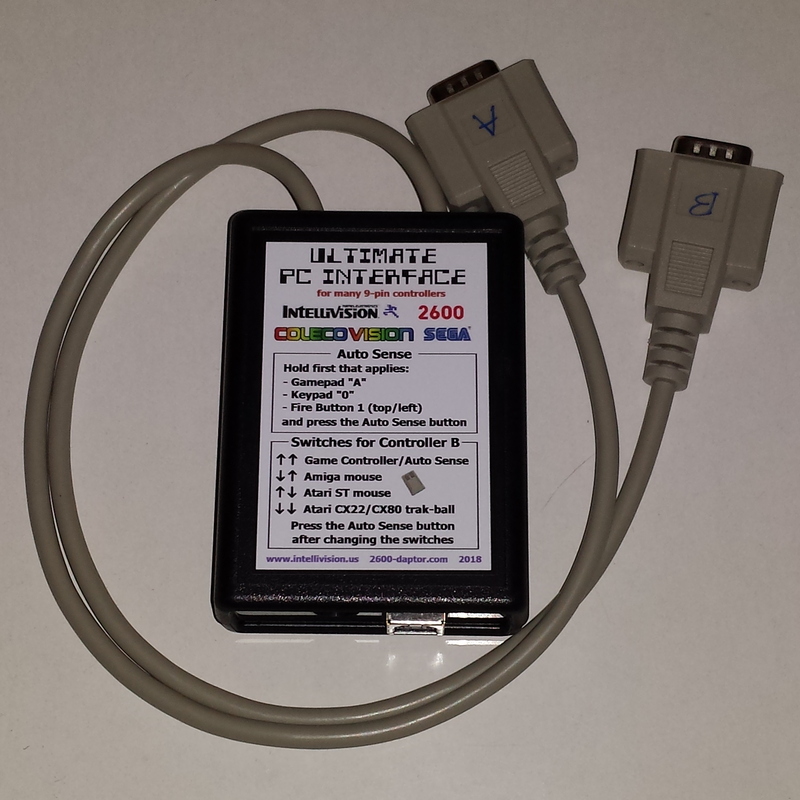 Ultimate PC Interface is the only interface that supports both ECS interfaces! And there is more! Support for the Colecovision, Coleco Rollerball, Coleco Driving Wheel, Coleco Super Action controller, Atari 2600, and Atari 7800 Proline controllers! (see support section below) is also included....along side with the Intellivision controller! Even though there are two connections to one interface, you can still mix and match controller types. A majority of controller buttons are mapped the same making it easy to define one controller type in an emulator and then change controllers without having to redefine it. • All Intellivision controllers are fully supported by the jzIntv Intellivision emulator (see support section below). 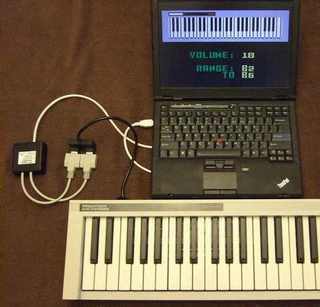 Emulators such as Nostalgia and MESS that support joysticks and mouse, will support the controllers but not the Music Synthesizer or ECS keyboard. • CoolCV, AdamEM, and MESS supports the Colecovision spinner (Super Action spinner, steering wheel, and rollerball) through mouse and joystick support. BlueMSX supports the Colecovision controllers. • Supports all 8 directions of the Colecovision, Atari, Genesis 3/6 controllers, and all other 8 direction controllers. 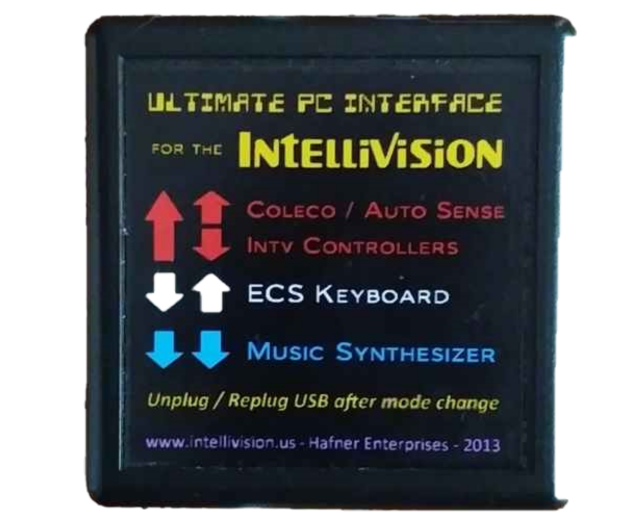 • Supports the Intellivision ECS keyboard. It works natively in the operating system. Use it in your word processor! • Firmware is upgradable (Windows O/S required) - CLICK HERE to view firmware upgrades and instructions on how to apply. 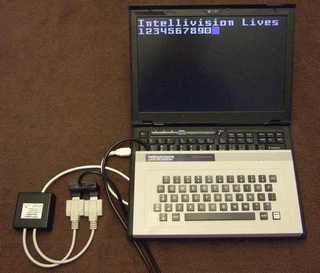 The Ultimate PC Interface is 100% supported by the Intellivision jzIntv emulator (Available HERE), the Colecovision CoolCV emulator (Available HERE) and all other emulators that supports USB devices as the interface presents itself to the operating system as a joystick. 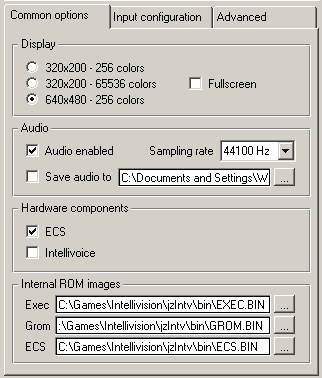 The Intv ECS keyboard and Intv Music Sythesizer modes may not be properly recognized by all emulators. 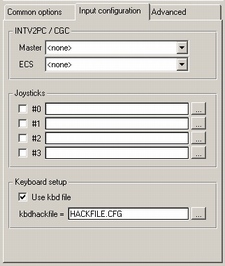 An example would be Nostalgia where it does recognize the ECS keyboard but Nostalgia uses the computer's ESC key to exit a game so Flintstones Keyboard Fun will not be playable. The interface unit has 4 modes. Use the switches to change the mode. See the interface label for reference. 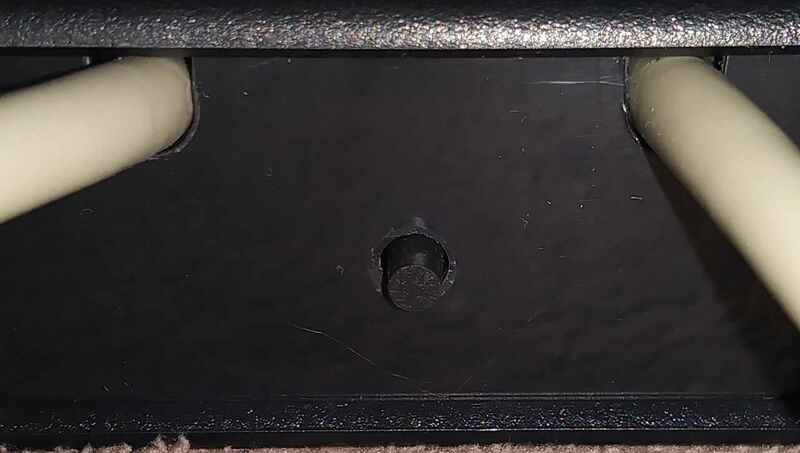 The side with the label is considered the TOP / UP side. NOTE: The interface (VERSION 2 only) MUST be unplgged from the USB and reconnected when switching modes. 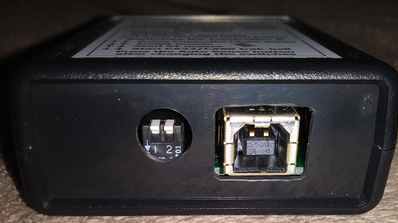 NOTE: The switches can be changed while the USB is plugged in (VERSION 3 only). After making the changes, press the black button. THere is no need to hold any mouse/trackball button. Switches affect jack/controller B only. Autosense Mode supports all supported controllers. The default mode (if no buttons are pressed when pluggin in the unit) remembers the last controller last recognized. To have the VERSION 2 interface recognize a controller below, press and hold for 5 seconds the required key/button while plugging in the USB or turning on your system if the USB is already connected. 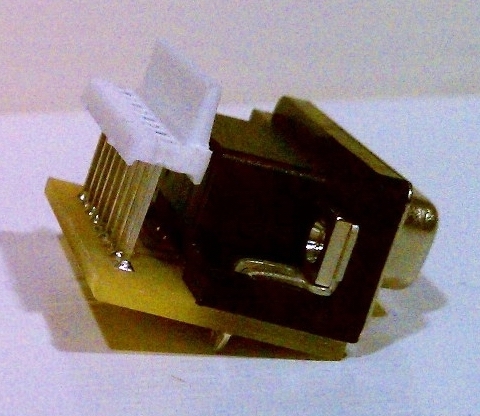 • Amiga/Commodore controller, press fire button or button #1 on 2 button controllers. • Coleco Steering Wheel: connect a Coleco controller and press zero. Connect the steering after the controller is recognized. 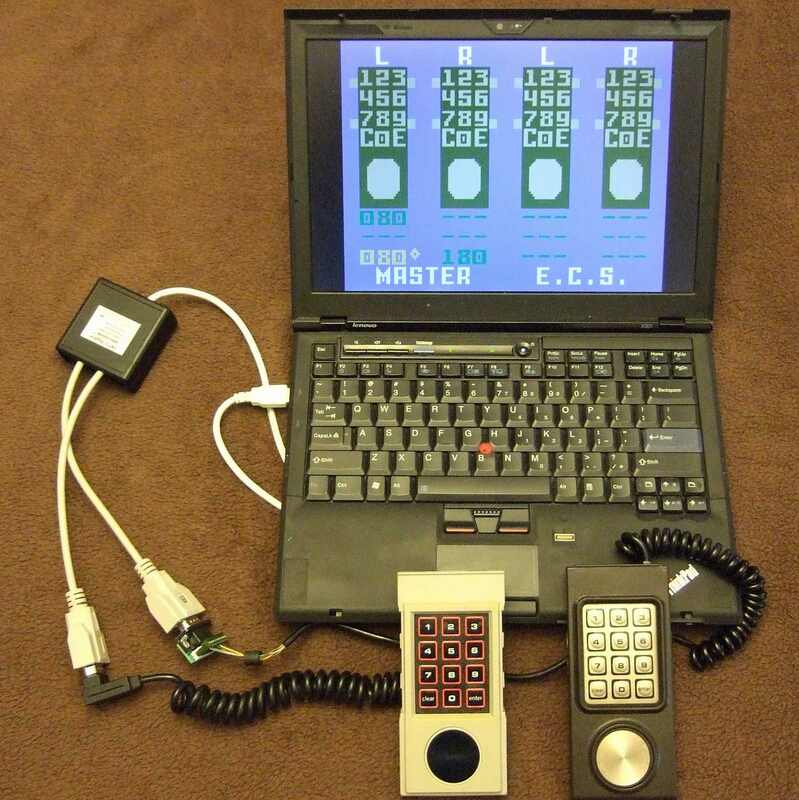 • MSX and X68000 controller, press fire button or button #1 on 2 button controllers. 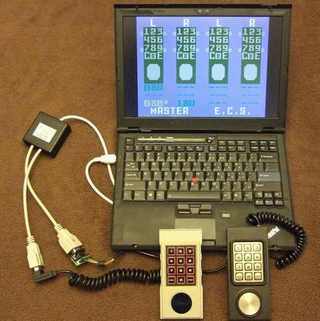 • TI-99 controller, press button #1. Only one controller in port A is recognized. Port B will not work with TI-99 joystick. •Analog controls (2600 paddles, 2800/SVAII knob, Bally Astrocade knob) turned full right can cause the controller to be miss-detected. Turn towards center. •The Atari 2600 paddles are part of a "2600-daptor" mode. When in this mode, you can freely switch between 2600 paddles, joystick, and driving just like you can with a 2600-daptor - no need to use AutoSense. 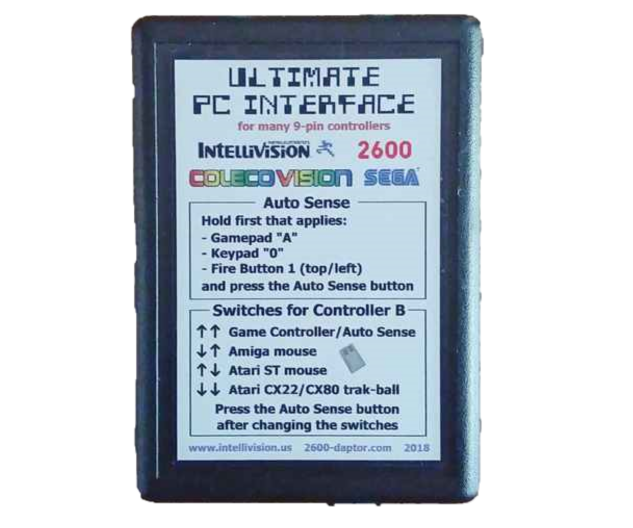 You can also AutoSense into this mode with 2600 joystick pressed right. AutoSensing with the 2600 joystick fire button will actually select Sega Master System mode, but this works just fine with the 2600 joystick & driving (but not paddles). 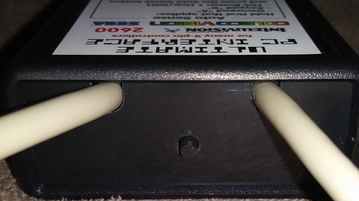 •To activate the joystick mode for the Coleco Rollerball and Steering Wheel, hold ONLY the asterick (*) key on both controllers. The Intellivision and Colecovision controllers support 3 additional keys. To activate them, press two keys at the same time. With the Intellivision controllers, holding down the 4 and the CLEAR buttons on the controllers, the interfaces returns to the emulator button 4. Holding down the 5 and the ZERO buttons on the controllers, the interfaces returns to the emulator button 5. Holding down the 6 and the ENTER buttons on the controllers, the interfaces returns to the emulator button 6. 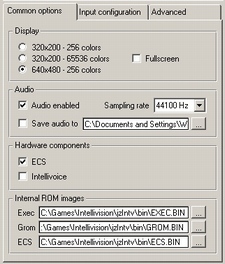 With the jzIntv configuration below, the emulator will PAUSE, RESET, or EXIT. With the Colecovision controllers, holding down the 4 and the right fire buttons on the controllers, the interfaces returns to the emulator button 7. Holding down the 5 and the right fire buttons on the controllers, the interfaces returns to the emulator button 5. Holding down the 6 and the right fire buttons on the controllers, the interfaces returns to the emulator button 6. 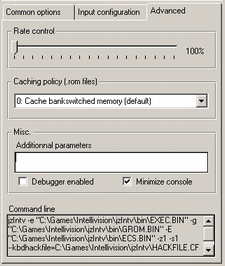 With the CoolCV configuration below, the emulator will FAST DISK, RESET, or EXIT. 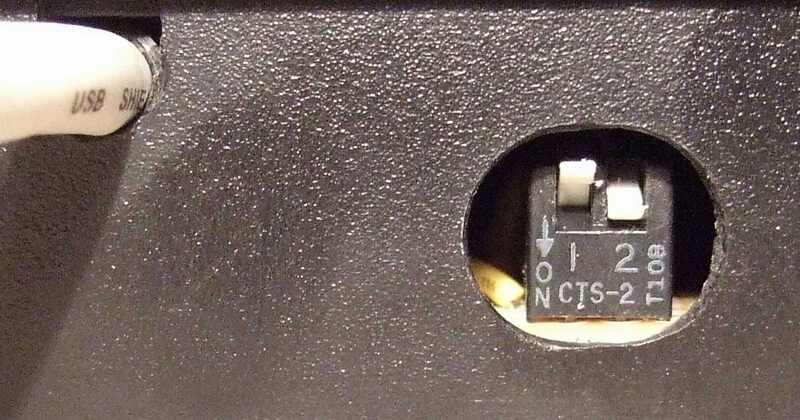 For the Sega Genesis, MODE + any other button (A, B, C, X, Y, Z, START) activates PC joystick buttons 9 & up. The two DB9 connectors are labeled "A" and "B". "A" is for the left controller and "B" is for the right controller. Connect the ECS interfaces as shown below. Holding the right fire button and pressing the 5 button will reset the emulator. Holding the right fire button and pressing 6 will exit the emulator. jzIntv supports multiple input configurations, F5, F6, and F7. F5 is the default mapping and F7 is used for the ECS keyboard. F6 (map 1) will be used for the Music Sythesizer. You may either use this HACKFILE.CFG which contains comments or you may configure your own hackfile using the settings below. 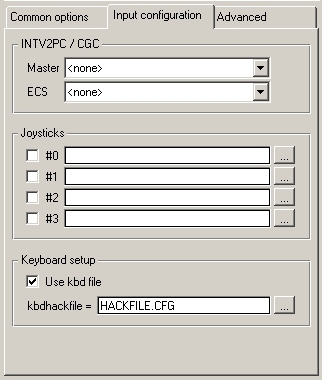 If you have not upgraded your unit to include Coleco/Atari support, use this HACKFILE.CFG. NOTE: The GUI does not handle long directory names that have a space (e.g. Program Files). 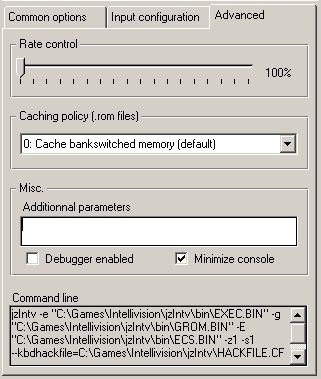 It is best to place the hackfile.cfg in the BIN direcotry where jzIntv.exe is located at and not specify a path as shown in the image below. Use these Intellivision test roms to confirm that the controllers, keyboard, or piano are responding correctly. CLICK HERE to download. jzIntv supports 4 controllers but not 4 joysticks. If you wanted to use 4 controllers, you would need a CGC. If you have 2 interfaces and want to use 4 controllers, use the Nostalgia emulator which properly supports 4 joysticks. - Mapping the ECS Keyboard - Nothing needs to be added to the hackfile for the ECS keyboard. Just press F7 to put the emulator in ECS mode. - Mapping the Controllers - Add the lines below to map controller "A"
- Mapping the Music Synthesizer - Add the lines below to map piano. Use "map 1" and press F6 in the emulator to activate.